We’re back with another installment in the home office makeover series. This time, I’ve got a round up of chairs. Jessica’s redesign has left her with a perfect nook for a reading chair, but she wants it to be just so–a chair with a high back and cozy feel. She asked me for some recommendations and here are some of my favorites. 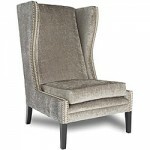 At 52″ tall, this Overstock.com chair is definitely taller-than-average, and the sleek wings keep it cozy. It would look absolutely stunning against Jessica’s painted purple brick wall, and would make a perfect spot for client calls or sketching design ideas. 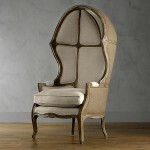 I’m a sucker for the high drama of this porter’s chair from Restoration Hardware. At a whopping 62″ tall, I think it may even be taller than Jessica herself, and it would create a cozy reading retreat in her office. The shortest of the bunch, this sleek ivory leather chair from Jayson Home and Garden is still 42″ tall (which is taller than typical occasional chairs). 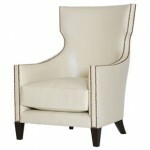 The nailhead trim gives it a classic look, but the chair still feels really modern because of the clean lines. 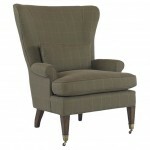 The Minimalist Wing Chair by Pearson is upholstered in a menswear-inspired windowpane plaid which gives it a sophisticated, cozy feel. It’s 45″ tall, so it’s a bit taller than the Sienna, and it has classic, yet sleek lines. So, which chair would you choose? And how do you feel about extra-tall chairs in the office? A few weeks ago, I received an email from a reader asking for recommendations for desk blotters. Between the oversize, ungainly calendars and the 1980s vinyl “leather-look” options, it’s slim pickings out there! But, if you’re in the market for an attractive desk blotter, look no further. 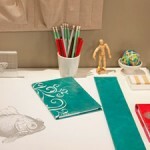 Here are my three favorites plus one great tutorial for making your own desk blotter. 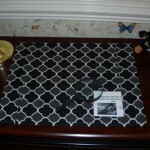 This 14 x 20 blotter by Labnutz features a quatrefoil pattern in sophisticated black and gray. 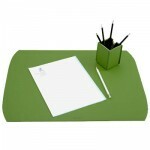 Depending on the size of your desk, it may be a bit too small, but it’s a great size for smaller desks. The side pockets are great for tucking away notes or other papers you want to keep front and center. Labnutz creates each blotter herself in Raleigh, NC. The Bella desk blotter from See Jane Work comes in five gorgeous colors. It measures 16 x 21 and features contrasting stitching. 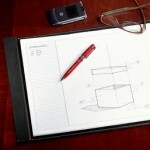 It’s handmade in Italian leather and measures 16 x 21.
offer plenty of space for notes and drawing. The pad itself is only 20 x 12 so it might be dwarfed by larger desks. Which desk blotter would you like for your own desk?